Glad to see you back at it. FWIW I have to say I didn't understand your dynamic equilibrium stuff at all until fairly recently. 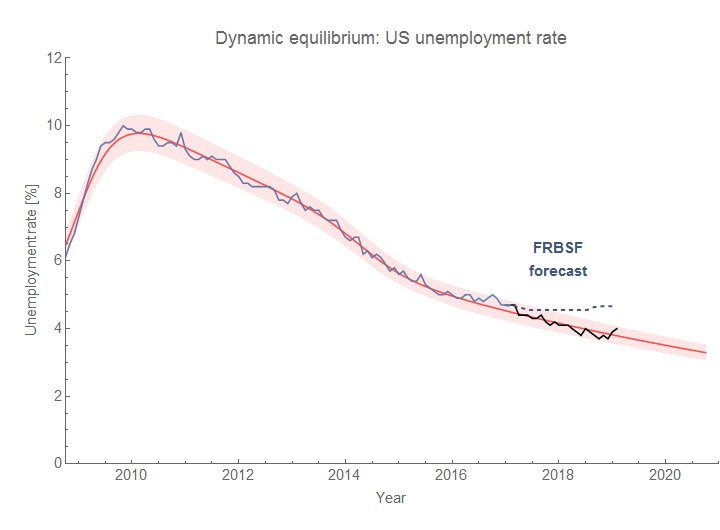 Now that I am getting a bit of your arguments, it seems to me that your dynamic equilibrium concepts (if they hold up) are quite revolutionary in their implications for economic policy. In a sense, it's "punctuated information equilibrium" where periods of information equilibrium are interrupted by disequilibrium shocks. I'd personally just hope that maybe some people would stop coming up with random models using "logic" or things that "seem right", and instead base their models on empirical data. Glad to hear from you again. A couple weeks ago I eyeballed 4.2% as the unemployment rate from recent levels that would have me thinking recession, and it looks like that might be just outside your... what is the accepted term for them? Uncertainty bands? Variance bands? Confidence interval? Unfortunately, I don't know what to make of shutdown effects, if any, on the data or the statistic. 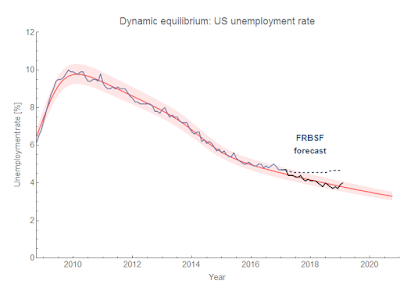 Of course, if I understand some of your recent work correctly, you would put more stock in your JOLTS models as recession indicators than the unemployment rate it seems. And I agree with Todd, and think your predictions concerning the unemployment rate seem like they have to be a good example of empirical success. Again, good to know you're still working at the project. They're called "single prediction error bands" in Mathematica (as in each new point should be within the band 90% of the time (the confidence level). But confidence bands or error bands are fine. 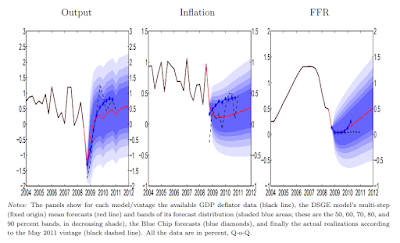 Yes, JOLTS showed signs earlier in 2008, and the extended series also shows they came first in 2001. For the two recessions, hires is about 5 months ahead. But this sample size is small (only a two recessions) so it's possible unrate could come first. Hey Jason, I'm looking at the applications of entropy to economics as well, but from a Boltzmann-Gibbs perspective rather than an information theoretic perspective. I couldn't find your email on this website, but I'd like to discuss it with you sometime! I think your work is directly related to mine.